Stress and all the physiological impacts it has upon a law enforcement officer’s body and mind are a major contributing factor to many of the ills that befall police officers and other law enforcement professionals. Even though this article is written using the term police officer, it isn’t meant to exclude other law enforcement professionals like deputy sheriffs, corrections officers, parole officers, probation officers, DA’s investigators, dispatchers, CSI’s, code enforcement officers, wildlife officers, park rangers, etc. The problems of stress seem inherent in the law enforcement profession in general and no one seems immune to its toxic effects. 3. A Stress Management Session (20-30 min) later in the day focused upon reducing mental stress. A career in law enforcement can become very toxic… and is surrounded with many dangers both overt and hidden. In the course of an average day a police officer might have to deal with violent offenders, sexual predators, toxic chemicals, auto accidents, drunks, tragedy, trauma, death and destruction and that’s just before lunch. 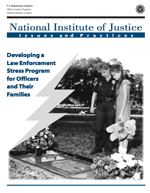 The symptoms of excessive and un-managed stress in law enforcement include: police officer suicide, depression, alcohol and drug abuse, domestic violence, heart attacks, cancer, disability and PTSD. These are the “Hidden Dangers” of a career in law enforcement and might be the result of chronic or cumulative un-managed stress. All of the things mentioned above can cause stress on the officer’s body and mind. Some of this stress is short lived and may dissipate quickly. Other stresses are more insidious and may be spread over an entire career, leading to more chronic problems within both their your body and mind. When coupled with the disruptions of shift work, fatigue, poor nutrition and inadequate self care, the situation is rife for major and long-term problems. The Rx3x solution involves both an officer and agency commitment to change the individual and group’s response to these disturbing factors. The first component is a fitness workout much like many officers already perform. It should involve 30-45 minutes of strenuous exercise designed to keep the officer’s body performing at peak ability. Physical fitness also helps the mind combat stress and builds the body’s immune system. The Mayo Clinic recommends a balanced fitness program involving five elements for a well-rounded routine. The five areas needed for performance improvement are Aerobic Fitness, Muscular Fitness, Stretching, Core Stability and Balance Training. Officers should try to vary their workouts during the week to include all of these components. Goal: To develop and improve your level of physical fitness which helps your stress management. The second component of the Rx3x system is a buffer workout between the officer’s work shift and going home. The workout should be some type of repetitious physical activity coupled with rhythmic deep breathing exercises and should have the main intent of relieving excessive stress. For example you could walk, ride a bicycle, run or work on the treadmill or stair step machine while focusing on your breath. Try to clear your mind and let the stresses from your day dissipate so that you don’t take them home with you. I know this sounds simplistic and on some days difficult to do, but with regular practice you will be able to quickly eliminate all but the most difficult stresses. Try to establish a cadence while repeating the word “Calm”. This is relaxing in nature and gives you a simple 4 count (C,A,L,M) to control your breathing. Goal: To relax and calm down before going home. The third and final component of the Rx3x system is a session of dedicated relaxation time with elimination of excessive stress as the primary goal. According to Herbert Benson, M.D., Associate Professor of Medicine at Harvard Medical School and the author of the book The Relaxation Response, “The relaxation response is a physical state of deep rest that changes the physical and emotional responses to stress… and the opposite of the fight or flight response”. Described simply, the “Relaxation Response” triggers a dramatic decrease in heart rate, breathing rate, blood pressure and metabolic rate that, with dedicated practice, counteracts the harmful effects of stress. His original research indicated that you could accomplish this with four things: A quiet environment, a mental device (like repeating a word or phrase), a passive attitude (putting aside distracting thoughts and always focusing on your breathing), and a comfortable position. His further research found that only the passive attitude and mental device were really needed, and this practice can be performed with exercise as long as the activity is repetitious and the intent is always to clear your mind of distractions and return your focus to your repeated word in sync with your breathing rate. You can call this meditation or “quiet time” if you prefer but there are many ways to accomplish it. You can learn more about these techniques at the Mayo Clinic website or other locations on the Internet. See the list of articles from the Mayo Clinic at the bottom of this article. Goal: To develop a regular stress reduction practice that allows you to evoke the physiological “relaxation response”. Stress management is not just an officer’s responsibility. In order to reduce the stresses of the job of enforcing the law, agencies must also take an active role in providing an environment and culture of reducing stress and promoting healthy stress management and fitness activities. 7. Organizational Support from your agency and its mental health support network. We also provide a “Realistic Threat Assessment of Wellness Vulnerabilities” using our Threat Assessment Instrument to evaluate the impacts of career stress and then create a plan for Mental, Physical, Emotional, Spiritual wellness built around protective factors that help to reduce the effects of chronic and cumulative stress. CALM – Quiet Your Mind, Relax Your Body CALM is Mandatory! Remember in Stress Management Small Steps Lead to Big Improvements! Lisa Wimberger works on a national level with law enforcement officers suffering Post Traumatic Stress Disorder, both at the agency and individual levels. Lisa’s ability to bring tools to law enforcement agencies offers a proactive solution to stress management and crisis intervention. These techniques are truly alternative modalities for a healthier person and organization. Lisa specializes in training individuals and organizations to understand, identify and retrain stress patterns that undermine job performance. Professor Edward LeClair has been a criminal justice professional since1969. During the last 15 years, working with dozens of police departments in Massachusetts and Rhode Island, Professor LeClair has researched, designed and implemented the Law Enforcement Officer Stress Reduction Program with unique training based upon gender and sexual assault investigator’s stress reduction. Asken, Michael J. and Dave Grossman and Loren W. Christensen Warrior Mindset. Millstadt, IL: Warrior Science Group, 2010. Anderson, Wayne and David Swenson and Daniel Clay. 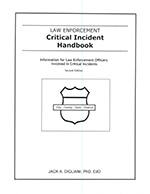 Stress Management For Law Enforcement Officers. New Jersey: Prentice Hall, Inc, 1995. Gilmartin, Kevin M. Emotional Survival For Law Enforcement. Tucson: E-S Press, 2002. Stay Safe, and Stay Healthy! 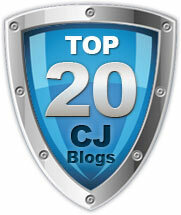 CopsAlive is written to prompt discussions within our profession about the issues of law enforcement career survival. We invite you to share your opinions in the Comment Box that is at the bottom of this article. We will help your agency create the kind of place that supports and protects officers so that they can do their jobs better, safer, longer and survive to tell their grand kids all about it. We do this by Helping Law Enforcement professionals plan for happy, healthy and successful lives on the job and beyond. We think the best strategy is for each officer to create a tactical plan for their own life and career. We call this Tactical Wellness planning and it’s part of our Armor Your Self™ training program. 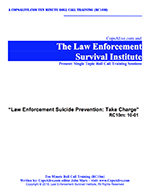 The Law Enforcement Survival Institute uses the Armor Your Self™ training program to educate law enforcement officers about how to cope with stress and manage all the toxic effects and hidden dangers of their career in law enforcement. We provide stress management and Tactical Wellness training for police officers as well as other law enforcement professionals. I have recently been given the opportunity to apply for a grant that is designed to supplement the on-going program, Preventing Violence Against Law Enforcement and Ensuring Officer Resilience and Survivability (VALOR). In addition, this grant seeks to expand its work in officer health and wellness. I have reviewed the material in this article/research and find that it is inline with the direction we wish to move. My purpose for contacting you is in asking if you would be interested in assisting with this initiative either by linking us to the resources/authors for the material or direct invovlvement with what will equate in the delivery of several mini day conferences. Our intent is to reach every officer within the Fayetteville Police Department in a minimum of three days in addition to opening our doors to other LEO’s in a ten county region. Unfortunately, like many law enforcement officers I have not spent a lot of time educating myself on total body wellness (mind, body, spirit etc.) so my approach to this request may be somewhat haphazard. Nonetheless, I do believe it is extremely important to right the listing ship if you will and I am asking for your thoughts on the best course of action. I have read where it may be important to conduct some type of pre-stress assessment, such as that the Mayo Clinic offers to set the mark on your proverbial measuring stick. Then, educate your audience leaving them with a prescription for long term care. And lastly, follow-up to determine if the benchmark has been reached. I would truly like your feedback on the matter and a cost analysis based on your recommendations should you consider this joint venture. We would be honored to help you in any way that we can, either by providing training or support information for you. I’ve sent you a longer email directly with some documents attached. I would like to ask if you are familiar with any studies that look at the impact of addressing (and possibly reducing) stress in police officers and the way that officers in stress reduction programs approach potential or real street crime and gun violence. I would be grateful to you if you have knowledge of any related research.